Kamakura Issaan is one of the best places to have soba (buckwheat noodles) around Tokyo station. We have been to this place many times as soba here is spectacular. It's always nice to have a favorite place where you are quite sure of the taste. If you are really into Soba, you should know that it is best to have it by "Zaru" and not in a hot broth like how we had it today. 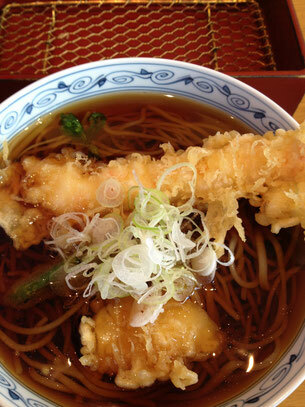 You dip the soba noodle into the sause (or rather soup) and try if it is chewy enough. You can't actually feel 100% how it is like if it's in a hot broth as hardness of the noodle will vary depending on the temperature. But today, we wanted to try the hot one since we already knew "zaru soba" here was excellent although we were not expecting the hot one to be this good. 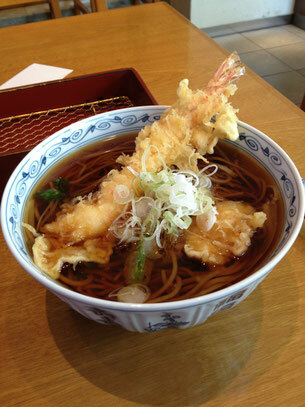 The deep fried shrimp on top of soba was also excellent. Perhaps this restaurant may also be able to open a Tempura restaurant. That is how well they prepare the deep fried for the soba. The soup was very tender and noodles matched perfectly with the soup. The hot broth in Issa Ann was favorably balanced and we even thought this could be one type of different soba cuisine that can stand out individually other than "zaru". Hi thanks for posting a warm comment about our website and sharing it with your friends! We'll work hard to post information about good restaurants in Japan to make tourists happy :-) Please enjoy Japan Weldy san!